Inspiration meets adventure in Barry’s book that chronicles the tragic death of his teenage son, Kevin, due to alcohol poisoning and his epic 1,400-mile journey from Arizona to Montana with Kevin’s ashes in his backpack. Barry Adkins has shared with tens of thousands of people the dangers of binge drinking, and his experience of losing his 18 year old son, Kevin, to alcohol poisoning. The day that was supposed to mark the beginning of Kevin’s adult life, turned out to be his last, and Barry’s message is both a powerful inspiration and a warning about the consequences of even one night of binge drinking.. Barry’s compelling presentation has saved countless lives and is fulfilling his dream to “make something very good” come from his son’s death. 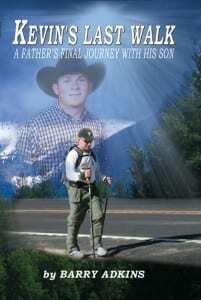 In 2007, Barry set out on an epic 1400 mile journey, and walked from Arizona to Montana with his son’s ashes in his backpack.